Only Stanford Park Hotel is near Stanford University, game changing start-ups, and Silicon Valley giants – yet feels a world away from the hype. Steeped in classic collegiate culture and infused with a welcoming neighborhood ambiance, this sophisticated respite defines understated elegance at its best. This quintessential independent luxury hotel welcomes you like a second home. Stanford Park Hotel’s inviting palm trees provide a sense of place, while the well-cared-for grounds suggest a relaxed retreat. Classic brick and shingle design combine with a Maybeck Morgan architecture to create a West Coast interpretation of traditional elegance. Every detail – from caring staff, to warm conversation spots by a fire and hand-picked, complimentary in-room snacks – put you at ease. Revel in collegiate spirit by picking up a literary classic. Join friends or colleagues in the courtyard for a fireside glass of wine. Hear a spark of a conversation between Stanford’s Nobel laureates and Silicon Valley’s leading minds during a relaxing dinner at our neighborhood bistro. Or just cozy up in your plush guest room for a quiet night. 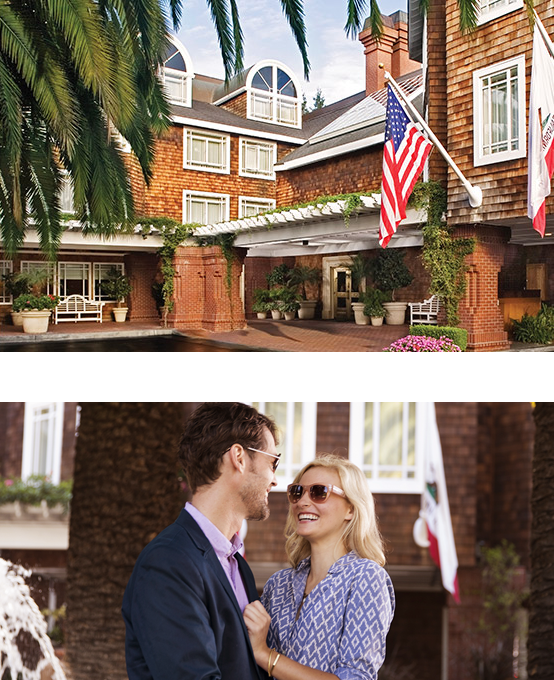 A sanctuary of understated luxury at the center of the world’s innovation hub — this is the Stanford Park Hotel. Our Silicon Valley sanctuary is like a second home to our many loyal guests, offering a thoughtful array of services and amenities, including an evening wine reception, a 24-hour business center, and "borrow-a-bicycle" program. Relax in our year-round heated swimming pool, and whirlpool spa. Pursue your favorite fitness regime at our state-of-the-art 24-hour fitness center, featuring Precor Cardio equipment and Paramount resistance machines, free weights, and a stretching area. We are proud to be conscientious stewards of our environment, and have ongoing environmental programs that include energy, water, and paper conservation; waste reduction; hazardous materials recycling; local and sustainable food procurement; environmentally responsible fixtures and appliances; furniture repurposing; and indoor environmental quality. We are proud to be recognized as a leading business in our efforts.